Gurtler Industries introduces the latest in cleaning technology specifically designed for the tough stains and soils of the industrial uniform market. The Work*Clean Team of products combine a unique mixture of surfactants, builders and conditioners to penetrate, lift, emulsify, and deep clean your toughest soils. Gurtler’s Research & Development chemists have developed a unique blend of multiple surfactants that deliver excellent results. Concentrated, advanced generation non-NPE, environmentally friendly detergent. Smaller dosage volumes result in faster injection times. Broad spectrum surfactant performance delivers effective performance on petroleum soils and natural food oils. Fluid down to temperatures as cold as 400 F for a consistent dispensing profile. Readily dispensed via multiple chemical-injection systems. Reduced freight cost for bulk deliveries, reduces inventory issues. Fewer package goods means less containers to inventory and recycle. A mixed classification industrial laundry implemented Work*Clean into their program. The results of the test are detailed in the following charts. Garment loads were evaluated for detergency and average soil release methods confirmed improved cleanliness. Standardized swatches were evaluated for soil removal. The swatches were soiled with a known amount of dirty motor oil (DMO) and mineral oil on both cotton and poly/cotton fabrics. Soil removal was consistently better by a factor of over 30% over the trial versus the baseline detergent performance. The baseline detergent used was a first generation industrial detergent. 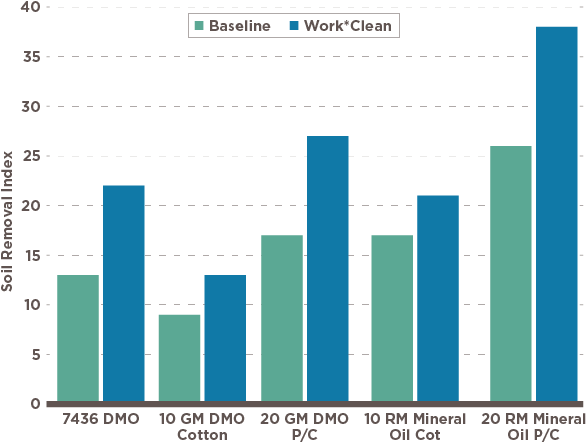 BASE LINE DETERGENT VS. WORK*CLEAN: Soil Removal is improved on Dirty Motor Oil (DMO) and Mineral Oil by an average of over 30%, on both cotton and poly/cotton (P/C) blends. 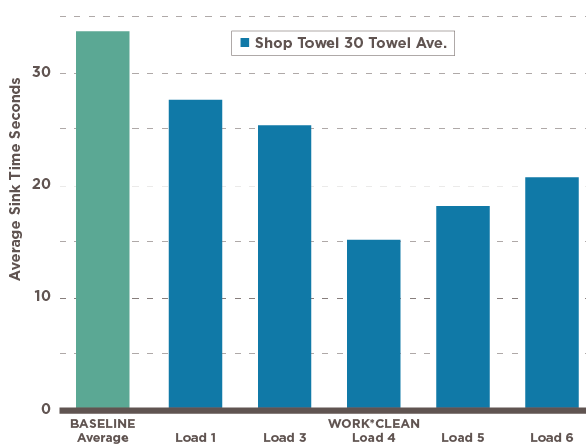 SHOP TOWEL SINK TESTS, BASELINE DETERGENT VS. WORK*CLEAN: The faster the sink time, the better the cleaning. Work*Clean consistently performs better than Baseline, an average of over 30% improvement in sink times. Bulk-goods were quantitatively evaluated and judged to be cleaner. Comments from the laundry team: The shop towels feel cleaner, bulk towel folder. “The new detergent has the proper chemistry balance to provide our garments with a higher level of soil release that not only leaves them cleaner, but also gives them a fresh clean scent!” Production leader.